Most black gospel groups that sang in the ‘40s or ‘50s and then changed their musical direction, changed it to rhythm and blues. 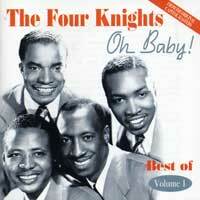 The Four Knights, however, were a refined gospel group that became a refined pop blues group. Actually they started out in 1943 as the Southland Jubilee Singers in Charlotte, North Carolina. The membership included Gene Alford (lead), John Wallace (second tenor and guitar), and Oscar Broadway (bass). By 1944 Oscar had brought in a baritone he knew, Clarence Dixon, and the lineup was set. Their soft and breezy harmonies drew immediate attention and the group made its debut on NBC’s affiliate WSOC-Charlotte radio. In six months they moved up to CBS’s mega power station, the 50,000-watt WBT-Charlotte. The quartet replaced the Southern Sons on the station’s “Carolina Hay Ride” show, a popular program that attracted one listener in particular, Cy Langois of Long-Worth Transcriptions. He signed the group to management. His first move was for a name change to the Four Knights. He took them to New York and they started appearing on Arthur Godfrey’s radio show in 1945. Lang-Worth was a company that made what were called transcriptions, actually early albums containing four to six songs on each side of an eight inch disc that played at 33-1/3 rpm. These discs were not sold to the public; most all were sent to radio stations, allowing a local disc jockey to give the impression the group was right in the studio. The Knights did a number of these recordings. Between this type of exposure and the Godfrey show the group became fairly well-known. In 1946 they signed with Decca Records and in April of that year they released their first single, “Just in Case You Change Your Mind.” After four singles featuring Gene’s mellow lead, Oscar’s broad bass, and usually incorporating Gene’s whistling over the instrumental section, the group was moved to Decca’s Coral affiliate for three more 78s through 1949. They toured with dancer Bill “Bojangles” Robinson and got a shot s regulars on the Red Skelton radio show in 1948. They spent two years doing Skelton in Los Angeles and performing in clubs across the country. The Knights lost the Skelton job in 1950 when their manager wanted more than the show could pay, and so he pulled the group. They then discharged him for losing what they considered to be a prime exposure medium. In 1951 they brought their soft harmony to Capitol Records and began with “I Love the Sunshine of Your Smile” (#23). They also began covering R&B and pop artists on songs like “The Glory of Love” (THE 5 KEYS), “Sin” (THE FOUR ACES), which they took to number 14, and their biggest pop cover record at number eight in 1953, “Oh Happy Day” (Don Howard). The group’s biggest hit came in 1954 when “I Get So Lonely When I Think About You (Oh Baby Mine)” reached number two and ran for 24 weeks, even becoming a smash in England at number five, a tough thing for a black American group to do in 1954. The Pat Ballard-penned original was so popular in England that when it fell off the charts it resurfaced the following month (July), reaching number 10. Toward the end of 1953 George Vereen began subbing on studio work and singing lead at live shows for Gene Alford, whose epilepsy was affecting his ongoing involvement with the group. Vereen was replaced in 1955 by ex-DELTA RHYTHM BOYS member Cliff Holland as Alford retired. Prior to their 1952 recordings the group sang with only a guitar backup, but Capitol soon had them working with full orchestras. By 1953, tours for the four were in full swing, and they played clubs from Las Vegas to Rio de Janeiro while appearing on the TV shows of Perry Como, Ed Sullivan, and of course Red Skelton. On August 27, 1954, they headlined at the famed Apollo in New York. During the mid-‘50s the reigning king op Capitol’s roster, Nat King Cole, ran into the group and liked their style; he asked Capitol to have the Knights back him on some recordings. 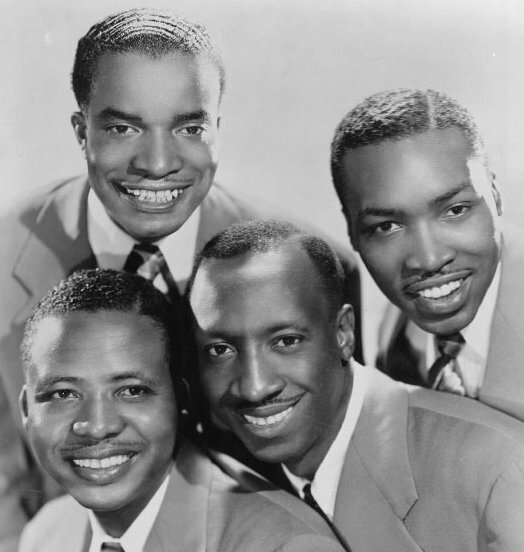 Their first collaboration, in early 1955, was titled “A Blossom Fell.” Though it didn’t chart, Nat and the Knights tried agin in January 1956, and by September their ”That’s All There Is to That” was number 16 on the pop char and number 14 R&B, the first time the Knights had ever appeared on the black charts. The next time out with Nat was the last: a ballad, “My Personal Possession,” released in May 1957 and reaching number 21 (#3 R&B). The only pop charter of the mid-and late ‘50s for the group by themselves was “O Falling Star” (#83, 1959) after they’d re-signed with Coral in late 1957. Capitol stayed with them for 39 45s throughout the ‘50s. In 1960 Gene Alford died. Clarence left the act in 1963 and the Knights disbanded three years after his departure. John Wallace died in 1978. Dixon and Broadway moved to the suburbs of Los Angeles in retirement. First ever legitimate CD release for this smooth pop orientated vocal group who scored numerous US hits in the early to mid-fifties. The vocal group of choice for label mates Nat King Cole who used them at every opportunity on his Capitol sessions. They scored a huge UK hit with "I Get So Lonely (When I Dream About You)" which reached number 5 in the summer of 1954. It's included here along with 25 other prime recordings on CD which was sourced from original EMI master tapes and compiled at Abbey Road Studios in London.